THE HUMAN RIGHTS group Amnesty International has sent observers to Ferguson, Missouri, to monitor authorities handling of protests there this week. This comes in the aftermath of Monday night’s announcement that a grand jury in St Louis had decided not to charge Officer Darren Wilson for shooting unarmed black teenager Michael Brown. This morning, Amnesty’s Executive Director in the US, Steven Hawkins, warned that “the eyes of the world” were watching how events unfold in Ferguson. This has to be made clear – the burden to keep protests peaceful is shared. Armored vehicles, tear gas and smoke bombs used large-scale against largely peaceful protesters in order to quell acts of violence by a minority only serves to escalate and exacerbate an already incredibly tense environment. The eyes of the world continue to watch the events in Ferguson as a measure of the United States’ capacity to respect the fundamental human right to assemble. Last night’s disturbances in Ferguson were smaller than Monday’s, although there were 45 arrests amid looting, arson and property destruction. In other American cities, there were strictly peaceful marches and vigils, as found in Philadelphia and Chicago, where there were no arrests whatsoever last night. In Los Angeles, however, 130 people were arrested, while 21 were detained in Atlanta, Georgia. 45 people were arrested in Boston alone last night. Demonstrators in New York City blocked the famous Lincoln Tunnel for a time last night, and held a sit-in at Times Square, where a failure to disperse led to a number of arrests. Email “Amnesty has sent its people to Ferguson to monitor police at protests”. 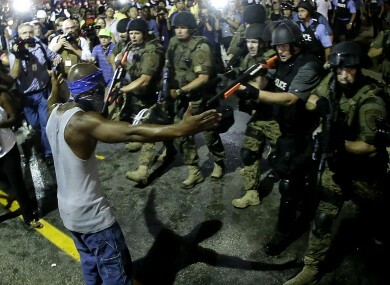 Feedback on “Amnesty has sent its people to Ferguson to monitor police at protests”.